No experience is necessary to volunteer! 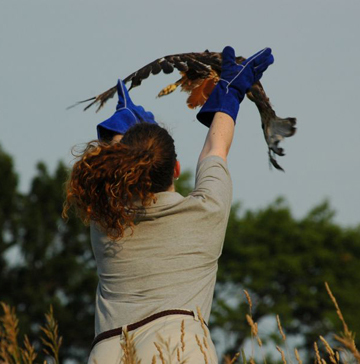 There are several ways you can get involved with the Raptor Rehabilitation Project. Our volunteers help feed, handle and care for our resident birds. Volunteers also serve as presenters at our public presentations and fund-raising events. Volunteers can observe and assist in the hospital under the supervision of senior Veterinary students. Like birds but not sure you’re ready to work with one? That’s okay! We can always use help with grounds-keeping, office duties, promotions, fund-raising…you name it. Being a volunteer with the Project doesn’t require a lot. You can be as involved as you like. Some of our volunteers participate for a couple of hours per week, while others donate several hours of their time each day. Call the College of Veterinary Medicine Teaching Hospital immediately at (573) 882-7821 or call (573) 882-4589 after 5pm and on weekends. These numbers are for reporting injured birds only. Please contact our coordinator for presentation inquiries. Copyright © 2013 — Curators of the University of Missouri. All rights reserved. DMCA and other copyright information.